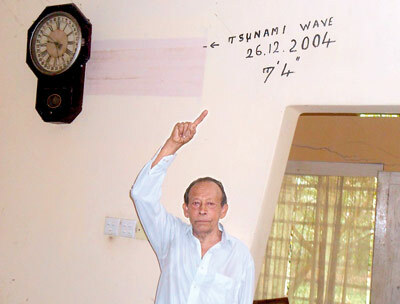 Eleven years after the boxing day tsunami in Telwatta, in Galle, the dream to build a museum in memory of those who died on that fateful day has not materialised yet, even after a pensioner donated his land for this purpose. 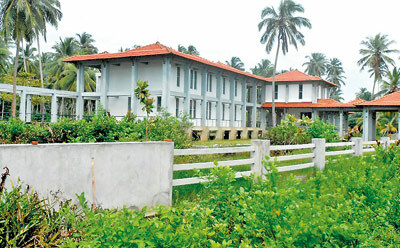 Ariyaratne Maduwage, a 79 years old pensioner donated a plot of land in 2005 for a museum to be erected. The Cultural Ministry started the construction of a Cultural Centre and a research laboratory on this plot of land, in 2011, spending millions of rupees. But so far it has not been completed due to various complications. Despite this, every politician visiting the area has promised the villagers that a museum for their loved ones would become a reality. Remembering that fateful day as a survivor Mr. Maduwage said he was watching a cricket match with his wife who was on a wheel chair on a typical weekend. “When the first wave came I rushed to bring a ladder and rescue the two children who were crying in the backyard of my property and I helped them to get onto the concrete roof which enabled me to save them from drowning. Thereafter more than twenty people used my iron ladder to climb on to the roof and escape the waves,” The village of Peraliya was badly hit by the waves which left 249 dead and 141 missing. “At around 9..20 a.m. the second wave came. It hit my house and damaged the house partially breaking the doors and windows. I and my wife who was on a wheel chair were swept some distance by the water and the water mark stood around seven feet high inside our house,” he said. The location of the tsunami train tragedy is a couple of metres from his house. A huge wave hit the Colombo bound train in the Southern city of Galle. More than 1,500 people were crammed inside the train. At least 802 died and hundreds remain unaccounted for. “Even three compartments of the train that got caught in the waves were to be exhibited in the museum. The clothes and the belongings of the deceased people are available to be displayed. The railway tracks which had been dislodged and thrown a distance of around 300 feet were there near my property,” he said. Mr. Maduwage said that he had given one acre of land to the people who were deprived of their lands to construct houses to resettle around his area but the political authorities decided to use this plot of land to construct the proposed Cultural and Research Centre for which the foundation stone had been laid in 2005. “The foundation stone has broken into pieces and parts are missing,” Yesterday marks the eleventh anniversary of the tsunami in which about 31,000 died island wide.